Want to make a real difference in a young child’s life? 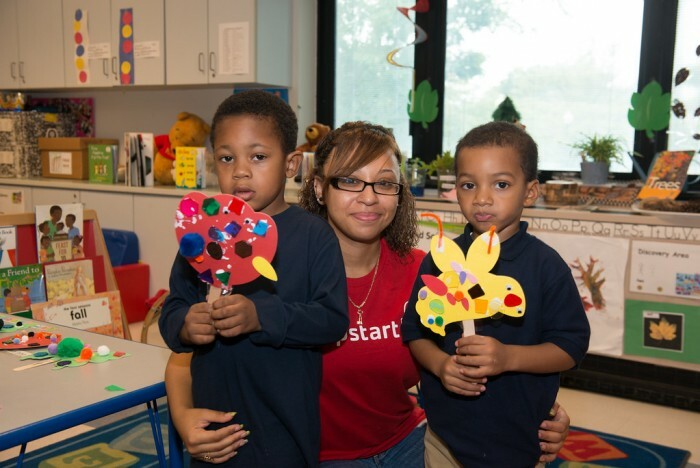 Southern students are now being recruited for the Jumpstart program, a national early education organization funded by AmeriCorps that recruits and trains college students to serve preschool children in low-income neighborhoods. The program aims to bolster children’s literacy, language, and socio-emotional skills. Southern is now in its third year as a Jumpstart partner, and students in the program work with local preschool children from three New Haven schools. The program not only provides Southern students with a high quality service experience; they also receive a stipend of nearly $2000 at the end of 300 hours of service, which are carried out within the academic year. Students must use their stipend toward the cost of tuition, books or loans, and they can also earn that amount in succeeding years, if they work at least 300 hours in those years. Of course, the preschool children benefit from the program as well — every year, Jumpstart’s Research and Evaluation team analyzes data about participating children’s language and literacy skills, and they find that the majority of children served by Jumpstart make at least one developmental gain. Southern students who participate offer instruction to the children for two hours per day, twice a week, as part of a supplemental program to the preschools’ existing curriculum. Students are asked to commit to 10 hours per week, however, to account for planning and training, says Amy Piccirillo, Southern’s Jumpstart coordinator. Piccirillo adds that Jumpstart is a full-year commitment, but work/study students can use it as their work experience and students in EDU 200 classes can count it towards their fieldwork. “Jumpstart is the highest quality experiential opportunity that is available at Southern,” says Dawn Cathey, a university assistant in the Office of the Dean of Student Affairs and an adjunct faculty member who teaches in the First-Year Experience program. Cathey is Piccirillo’s campus liaison. “Employers are looking for experiential opportunities in students’ backgrounds,” Cathey adds. Piccirillo is still recruiting students for the 2014-2015 academic year, hoping to attract at least 42 students, “but more would be great!” Southern students are currently being trained for Jumpstart, but new recruits are welcome to join at any time. Piccirillo says that if a student does fewer than 300 hours over the year, he or she will still receive a prorated monetary award at the year’s end. Students interested in working in the Jumpstart program should contact Piccirillo at piccirilloa2@southernct.edu. 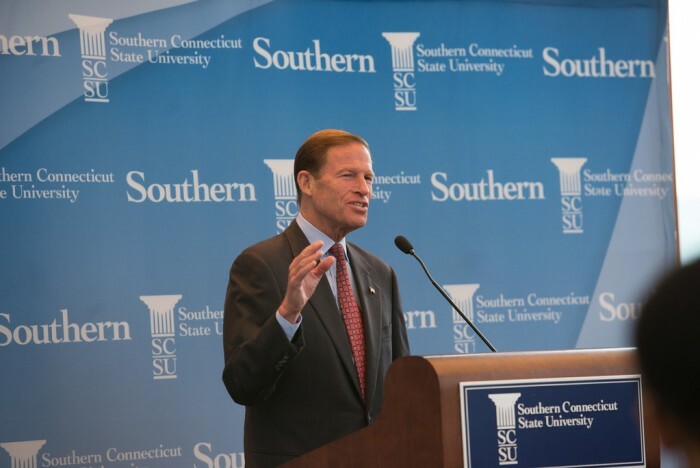 U.S. Sen. Richard Blumenthal (D-Conn.) spoke with SCSU President Mary Papazian, students, and faculty at a campus round table on Sept. 24 to discuss his new legislation aimed at expanding the existing Public Service Loan Forgiveness program. According to Blumenthal, this would provide meaningful student debt relief to teachers, police officers, public health workers, and others who dedicate their careers to public service. “The Public Service Loan Forgiveness (PSLF) program provides an important incentive for graduates to enter public service occupations by offering relief from student loan debt,” Blumenthal said. “Because of the increasing frequency of graduates facing crushing amounts of student loan debt, that incentive is more important than ever. The Strengthening Forgiveness for Public Servants Act would enhance the incentive to enter public service by allowing graduates to receive loan forgiveness in proportion to their years of public service. In addition, the act would allow new participants in the PSLF to have their loans placed in deferment during their employment. Lastly, in order to avoid any confusion about which occupations qualify as public service, the bill requires graduates to fill out an employment certification form in order to participate in the PSLF program. “Teachers, police officers, public health workers, and other public servants should be applauded and supported — and not drowned in debt to pay for the degrees many such jobs require,” Blumenthal said. On July 13, he investigated a commemorative plaque honoring indicted war criminal Ratko Mladić that had been installed in the hills above Sarajevo in late May or early June 2014. (See home page photo and photo of plaque.) The plaque is located on a hill seized by the Bosnian Serbs in April 1992 as strategic high ground for their attacks on the city of Sarajevo and is situated between what was a sniper position (to the right) and tank position (to the left). David Pettigrew has been thinking about Bosnia for a long time. For the past several years, the professor of philosophy has been researching and writing about the genocide that took place during the Bosnian War in the 1990s, and he now focuses particularly on the widespread and systematic efforts to exclude Bosniaks (Bosnian Muslims) from their former homes. Through his writing, lectures and a film on which he collaborated with his son, Pettigrew has expressed his deep involvement in efforts to gain recognition of the atrocities that took place in Bosnia. This past summer, he attended a wreath-laying ceremony in a cemetery in the Bosnian town of Višegrad, a ceremony that held great significance for the town’s refugees. 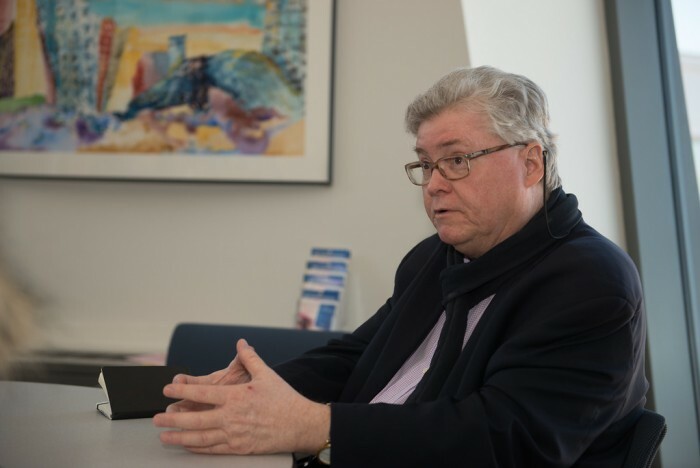 His trip to Bosnia also involved research related to his book manuscript, “Witnessing Genocide in Bosnia: Pathways to Justice,” and lectures for the students of the Srebrenica Summer University. Pettigrew explains that in January 1992, Republika Srpska (RS) declared its existence, but the territory RS claimed was within the borders of Bosnia and Herzegovina and that in many areas Bosniaks comprised 80 to 100 percent of the population. When Bosnia (including the territory of RS) was recognized as an independent nation in April 1992, Yugoslav and Bosnian Serb forces began trying to remove all Bosniaks from the territory of RS through murder, terror and forcible displacement. Pettigrew became particularly interested in Višegrad because of the nature of the atrocities there and because the town continues to maintain a culture of denial regarding these atrocities. Notorious incidents known as the Bikavac and Pionirska Street tragedies involved the herding of villagers – mostly women and children – into two houses, where they were locked in and burned alive, the houses set on fire. In May 2012, their remains exhumed, 66 victims of the Višegrad genocide were buried in the town’s Muslim cemetery, and local activists erected a monument that refers to the “victims of the Višegrad genocide.” Pettigrew says the RS authorities ruled that the monument could not include the term “genocide,” and it seemed that the memorial would be destroyed. Activists asked Pettigrew to intervene, and he wrote a letter to the Office of the High Representative in Bosnia and Herzegovina, identifying the decision to destroy the monument as discriminatory, as apartheid, and as part of a widespread effort to prevent those who were expelled from their homes in 1992 from returning. His letter received extensive coverage in the Sarajevo press. The monument remained. On July 16, he went to Višegrad with about 10 faculty from Sarajevo to lay a wreath at the monument. The wreath bore a ribbon with a message suggested by Pettigrew: “To the memory of the victims of the Višegrad genocide: May truth lead to justice.” He says the message on the wreath was designed to resist genocide denial and to support the local activists and survivors. The event received extensive press coverage on Bosnian television and in print. A statement Pettigrew made for the press was posted on the Helsinki Committee for Human Rights in Serbia website as well as on a Bosnian diaspora blog from Sweden. Pettigrew says that symbols placed around Višegrad are meant to be psychologically intimidating, such as a statue put up to honor and celebrate the perpetrators of the genocide. Other powerful symbols include Serbian Orthodox “spite churches,” built in the areas where the genocide took place (see photo at right). Pettigrew says the churches are “meant to be insulting or intimidating for the Muslims (Bosniaks) who try to return to their former homes.” He gives as an example a church in Budak that he researched this year: it is being constructed in an exclusively Muslim village, next to a former mass grave, on the route of a death march, and is sited so that the steeple and its flag of RS can be seen from the cemetery where the victims of the genocide are buried. Pettigrew is giving two presentations on his research this fall: one as part of the Yale Genocide Studies Seminar Series and another in Paris in November. He is also teaching a new course this semester on the Holocaust and Genocide Studies. More information about Pettigrew’s work can be found on his website. Deepta Ramesh likes having a lot on her plate. In addition to a class and developing her honors thesis, the senior finance major is holding two paid internships this semester – one in the field of marketing, the other in finance. 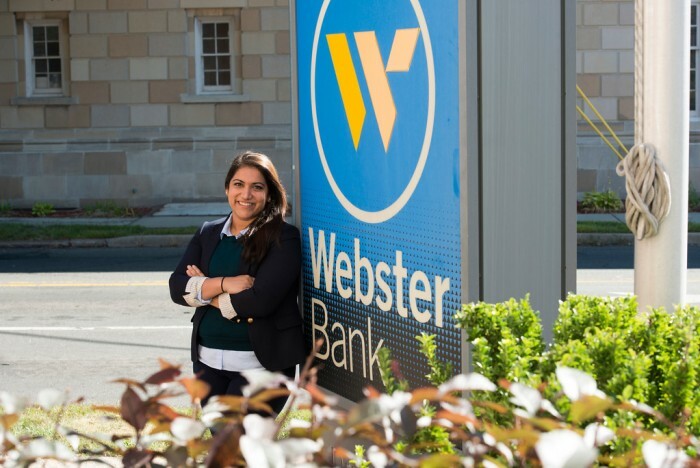 The latter internship came about after Webster Bank opted to create such a position earlier this year to help with its treasury and payment solutions. It specifically asked Southern students to apply because of the university’s treasury management program – the only certified program of its kind in Connecticut, and one of a relative few in the nation, according to James Thorson, chairman of the Economics and Finance Department. To be eligible for consideration, a student must have had a 3.0 GPA or better; be a senior undergraduate or a graduate student; have work experience or class experience with leadership and business skill-related responsibilities and have completed the Essentials of Treasury Management course with a grade of B-plus or better. The course examines how businesses handle their liquid assets, like cash, with the intent of making sound financial investments. Treasury management is sometimes referred to as cash management. Ramesh says she went through three interviews before being hired. The first interview included two senior vice presidents, while the second involved a panel of people. She says she works full days at the Webster Bank office in Hartford twice a week. During the first half of the internship, she is focusing on data analysis. The second half will involve implementation. The internship will conclude in December, when she will be required to write a five-page analysis and develop a presentation for Webster. Ramesh is a South Windsor resident and a member of Southern’s Honors College. At first glance, it may seem like a waste of time, especially to those with a go-go-go, Type A personality. There is an obvious recognition that sleep is necessary, but it can also be accompanied by a twinge of guilt since nothing tangible seems to get accomplished after a visit from Mr. Sandman. 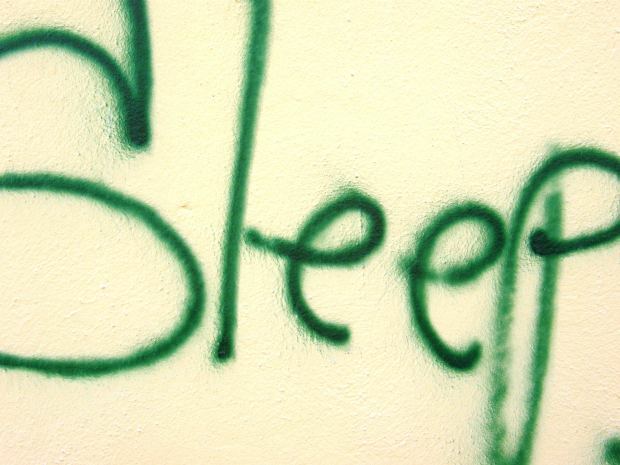 As a result, people tend to cheat on sleep, in some cases cutting a few hours a night. Instead of the recommended 7 to 9 hours for most teens and adults, many people get only 4 or 5 or 6 hours. Despite protests to the contrary, teens and adults need 7 to 9 hours of sleep a night to function at 100-percent capacity. She says that many myths continue, such as the amount of sleep that young adults need. Some feel that since high school and college students are young and can recover physically from stresses better than older folks, the same must be true for staying up late and getting up early. But the evidence points otherwise, according to Lamberti, who did her doctoral dissertation on sleep among college students. Similarly, the notion that senior citizens need less sleep than the rest of us is also a myth, she says. Lamberti says that Americans are getting less sleep and reduced sleep quality today than 30 years ago. “This is probably due, at least in part, to our hyper-connected world and the hectic pace of society,” she says. So, what should we do? Lamberti offers several suggestions to improve sleeping habits. *Sleep in a darkened room. This signals to the brain that it’s nighttime and time to sleep. Having the TV on, lights on, etc. can trick the brain into thinking it’s still daytime. That may help to keep us up a little longer if we really need to on a given night, but we’ll pay for it. *Try to avoid watching TV, eating, or reading while in bed. Again, this helps train the brain that when you’re in bed, it’s time to sleep. *Caffeine should be avoided in the evenings, and for some people, should cease after lunchtime. *Alcohol and many other drugs affect sleep patterns, resulting in a less-than-refreshing night of sleep. *On the other hand, exercising helps, especially if it done 4 to 6 hours before sleep. It takes a while to wind down from a hard workout, so avoid strenuous activity immediately before going to bed. *Turn off the computer a few hours before sleep. The computer stimulates parts of the brain and can delay sleep. Southern has pledged to join the Institute of International Education (IIE)’s Generation Study Abroad initiative to double the number of American students who study abroad by the end of the decade. The initiative is also focusing on increasing the diversity of the students who study abroad, ensuring quality, and removing barriers to participation. Currently, 150-200 Southern students go abroad every year, their destinations ranging from Botswana to Belgium. The university is able to send students to more than 300 prestigious host institutions worldwide and currently offers 10 faculty-led programs administered by the university, but also affiliates with International Student Exchange Programs (ISEP) as well as 14 sister institutions in Spain, France, Germany, England, Vietnam, and China. An increasing number of Southern students apply for and receive Gilman, Rotary Foundation, ISEP, AIFS, and other scholarships to study abroad, and almost all eligible financial aid recipients apply their aid and/or scholarship funding to their study abroad experience. IIE’s Generation Study Abroad initiative, launched in spring 2014, now has over 300 commitments. The partners who have joined to date include: U.S. colleges and universities from 46 states; non-U.S. institutions; education associations; study abroad organizations; U.S. and foreign government entities, including the U.S. Department of State, Bureau of Educational and Cultural Affairs. Recognizing the importance of an internationally focused workforce, IIE is also actively seeking the participation of corporations and the business community. Learn more about IIE’s Generation Study Abroad initiative and see a complete list of commitment partners. Sociology and writing fiction are not that different from one another, if you ask Jon Bloch. The sociology professor’s novel The Identity Thief comes out this month, and he says the novel’s theme of self-identity also interests him as a scholar. “Sociologists believe that the self is socially constructed,” Bloch says. “It’s difficult to say if there is a true self or not.” As for the familiar question of whether nature or nurture creates the self? “We focus more on the nurture,” says Bloch. In the novel, the thief and the victim take turns narrating the story, chapter by chapter, and Bloch says that ironically, the thief is the more sympathetic of the two: he is out of work and desperate for money. The victim, Bloch says, is something of a sociopath, but still feels like he’s been robbed, not only of his money but also of something essential to himself. In today’s world, Bloch says, “things like your zip code or Social Security number can affect how you’re treated by the world. So when someone has access to those kinds of basic information about you, it raises the question of not only who are you but also who is the identity thief.” Bloch himself has been a victim of identity theft. The novel, which is being published by Bacon Press Books, will be available in both a Kindle edition as well as hard copy. *Juniors Mads Larsen and Jonas Folstad of the men’s soccer team were featured in a Sept. 15 story in the New Haven Register. *John Nwangwu, professor of public health, is an expert on infectious diseases and serves as a consultant to the World Health Organization. He was tapped to assist with the prevention of the spread of the Ebola virus in Africa. He was interviewed by several media organizations, including the New Haven Register (Sept. 3); Channel 8 (Sept. 4); WNPR (90.5 FM) (Sept. 3) and WQUN (1220 AM) (Sept. 3) radio stations. *Elliott Horch, associate professor of physics, was quoted in a Sept. 4 article in the Daily Mailnewspaper in Great Britain regarding research he has conducted about binary stars. His research indicates that up to 50 percent of stars which host planets may be part of a binary star system (two suns). *John Moscatel, a senior football player who lives in Lexington, Mass., was featured in a Sept. 4 story in the Boston Globe. Expect to see a dramatically different campus landscape less than a year from now as two major building projects are completed. And the upcoming creation of a new Master Facilities Plan will chart the university’s future course of development. 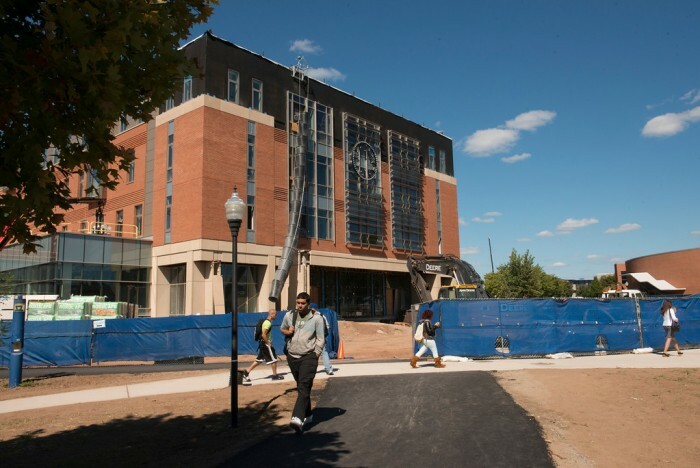 So says Executive Vice President James E. Blake, who notes that the renovation to Buley Library and the construction of the Academic Laboratory Science Building are on time and progressing well. The renovation work to the older wing of Buley Library should be completed by late November or December, according to Blake. He said that once that is finished, the newer wing of Buley will undergo some final preparation work that should be completed early in 2015. The library will encompass about 245,000 square feet when completed. It will include an atrium and skywalk connecting the two sections of the building. Among the features of the library will be the creation of an art gallery, as well as space for media collections, special collections, a cyber café, and an “information commons,” an area that will include a computer lab, lounge seating, email stations, a reference help desk and an IT help desk. It is also expected to include three classrooms, two computer teaching labs, a seminar room, a conference room and a tutorial center. Plans call for a covered skywalk connecting the new science building with Jennings. The new building will host teaching and research labs for physics, earth science, environmental science, molecular biology and chemistry. It is also expected to include a supercomputing lab for research in theoretical physics, bioinformatics and computer science. In addition, plans indicate that both the Werth Center for Coastal and Marine Studies and the ConnSCU Center for Nanotechnology will be located in the building. Other amenities anticipated are an outdoor rock garden, six rooftop telescope stations, classrooms, office space and study/common areas. Blake notes that a new university Master Facilities Plan – a document that outlines the university’s facility needs for the next 10 years – will be developed during the next six months. A consultant will examine the current and projected enrollment, space allocation, and other factors. Blake says a Master Facilities Plan Committee is scheduled to hold its first meeting on Sept. 18. The panel will meet periodically during the next several months and finalize a report by late winter or early spring. The plan would then go to the Board of Regents for review. “I’m sure there also will be at least one or two town hall-style meetings for the campus community to learn about the plan and offer suggestions and insight,” Blake says.